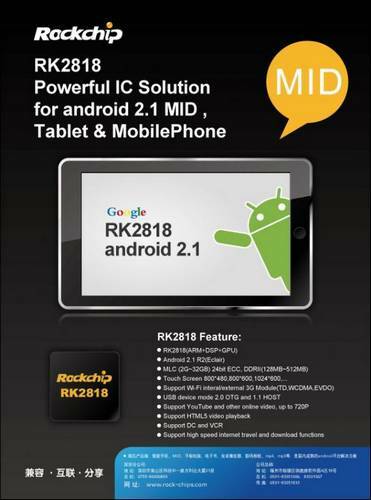 A new generation of Android chip is set to come from Rockchip, the RK2818 for tablets and mobile phones. The RK2818 chip will support Android 2.1 devices and allow 720 HD video recording, Flash, and HTML5 Video. It features 660 MHz ARM, DSP, and GPU three-core processor, support up to 512MB RAM, and 800×480, 800×600, 1024×600 screen resolution and 3G module integrated to allow 3G connectivity (TD-SCDMA, WCDMA, CDMA2000 EVDO). We dont know yet which are the Android 2.1 devices that will be running this chip but we will find out very soon and update this post.